Moderate. In mild winter areas or sheltered sites, seedlings that sprout in autumn may survive to spring. Seedlings that sprout in early spring easily survive light frosts. You can use the light texture and soft colours of nigella to break up clashes between cornflowers and calendula, which can be grown on a similar schedule. 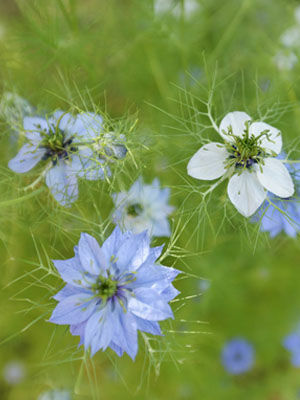 Because nigella blooms for only a few weeks, it is best to sow seeds two or three times from late spring to early summer. Flower colours include white, blue, pink and purple.